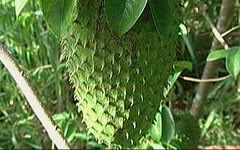 blogsters guild: 'GRAVIOLA' NATURE CURES CANCER? Since our inception in 1996, Health Sciences Institute has scoured the world to find cutting-edge treatments few people have access to or have even heard about. And sometimes, what we uncover startles even the medical mavericks on our board. Two months ago, we learned about an astounding cancer-fighting tree from the Amazon that has literally sent shock waves through the HSI network.